As efforts to clean up Portland Harbor begin, the communities most affected by pollution see a chance to reconnect to the Willamette River. When Wilma Alcock was young, she fished the Willamette River nearly every weekend. Her favorite spot was Mock’s Bottom—a crescent of land that lies at the base of the steep bluffs along Willamette Boulevard. It has since been swallowed up by the Swan Island Industrial Park, but back then it was just marshy riverbank. On warm summer evenings and crisp fall days, Alcock clambered down to the water to dip her line in the lazy current. She caught bluegills, ring-tail perch, and crappie—a tasty black and white speckled sunfish. “We used to catch them plentiful,” Alcock recalls. Now seventy-nine and retired after a career in nursing and childcare, she has an infectious laugh, short white hair, and smooth skin that belies her age. Alcock grew up fishing, like many people of her generation in Portland’s African American community. She learned from her father, who always called her Bill. “You know, Wilma, William, Bill,” she explains. She got a cane pole at age eight and baited her first worm not long after. That’s when, she says, the “first little bit of callousness” came into her life. She knew how to cast by ten and has fished ever since. But Alcock stopped fishing the Willamette in the 1970s. Part of the reason was that she was busy raising her four children. But it was also because the river had become so polluted that her catch was visibly unhealthy. “You didn’t need nobody to tell you not to eat the fish,” Alcock says. Signs warning against eating fish from the Willamette eventually went up in 2004, four years after the Environmental Protection Agency declared the Portland Harbor a federal Superfund site—a ten-mile reach from the Broadway Bridge to Sauvie Island. While salmon and other migratory fish are safe to eat, the Oregon Health Authority advises healthy adults to eat a maximum of one meal of resident fish per month. For children and pregnant or nursing women, that number is zero. The EPA has now released a plan to clean up the river after sixteen years of environmental studies. Three million cubic yards of contaminated sediments will be dredged from the river and more will be either removed from the banks or sealed in place. The cleanup will take thirteen years and cost polluters at least a billion dollars, but it will make the fish safer to eat and hasten the recovery of the river’s ecosystem. Environmental justice advocates also see the cleanup effort as an opportunity to do right by those who have suffered the most from the pollution. Although the contamination has affected everyone who uses the Willamette, the impacts have fallen disproportionately on those who tend to fish the most: tribal members, people of color, low-income residents, and those from other marginalized groups who rely on the river for food. Organizations like the Portland Harbor Community Coalition, an alliance of individuals and associations representing Native American, African American, immigrant, refugee, and homeless communities, are trying to ensure that people from impacted groups get access to jobs associated with the billion-dollar project. They also want community members to have a role in monitoring progress and deciding how riverfront real estate should be used after it’s restored. Many in Portland’s Black community say the cleanup offers a way to reclaim a connection to the Willamette River. That connection began with World War II shipyards and continued over decades spent living along the water and fishing. But the bond suffered as pollution made the fish unsafe and economic changes pushed many African Americans out of neighborhoods near the river. Many say the connection has been lost. Because of its rivers, the Portland area has always been an appealing place to live, first to the Chinookan peoples who called the region home for millennia, and later to the settlers who began flocking to Oregon in the 1830s. Portland was incorporated in 1851, and local Native Americans were removed to reservations in 1856. The young city grew up around the Willamette. The industries along the river’s shores quickly became the city’s beating heart, the current its lifeblood. For the next 150 years, the working river generated both prosperity and pollution—though neither would flow equitably to all of Portland’s residents. At first, the Willamette carried mighty logs, some wider than a person is tall, often strung together in giant floating rafts. Portland’s mills turned them into lumber, furniture, and paper. 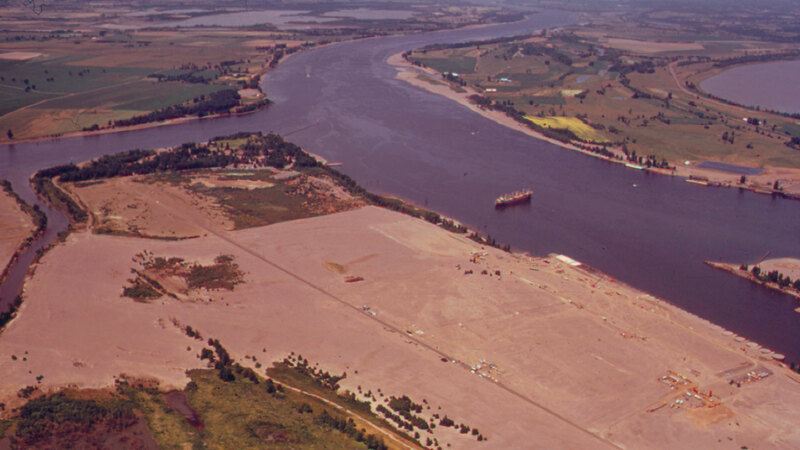 By 1910, Portland had also become the largest wheat port in the country. Then, during World War II, its docks became wombs of the war machine. In total, local shipbuilders assembled more than a thousand transport ships and tankers. Newcomers flooded in to work in the shipyards between 1942 and 1945, including an estimated 20,000 African Americans. The city grew by a third and Portland's Black population increased ten-fold. Alcock’s family was part of this great migration, coming by train from Oklahoma when she was just five. Both of her parents found work at the Swan Island shipyard, one of three in the Portland area owned by the industrialist Henry Kaiser. But Portland’s white majority didn’t make the new residents feel welcomed. Until 1926, Oregon’s constitution prohibited Blacks from residing or owning property in the state, and racist policies remained widespread. When Alcock’s family first moved to town, they lived at the intersection of North Russell and Interstate, in the building that now houses Widmer Brothers Brewing. Alcock remembers that the tavern on the ground floor did not serve Blacks—a common practice at the time. “It was quite prejudiced,” she says. Things weren’t much better in the shipyards themselves. Despite an executive order from President Roosevelt barring discrimination in defense industries, the trade unions had tremendous control over hiring practices, which they used to protect white workers, especially early in the war. According to research by historian Rudy Pearson, African Americans were excluded from the white unions and frequently could not put their technical skills to use. Instead, many told stories of being offered the dirtiest, most undesirable jobs, like scraping rust off the bottom of the boats. Alcock’s mother, Jessie, started out as a sweeper, cleaning up construction debris, and then got promoted to a chipper, like Alcock’s father. Chippers used hammers to clean up welded seams. It was good money, and Alcock’s parents soon saved enough to buy a house on Albina Avenue. But the work likely took a toll on their health. Alcock’s father, Leonard, died in 1988 of mesothelioma, a type of cancer linked to asbestos exposure that often afflicts the lungs. It has affected many people who worked in shipyards from the 1940s through the 1970s, when asbestos was used for insulating ships. The toxic combination of asbestos and cigarette smoking also put many shipyard workers at high risk of developing other kinds of lung diseases. Alcock says it’s hard to know what caused her father’s case. He also worked other jobs that could have brought him in contact with asbestos, like coal mining. “He had been exposed so many times,” she says. “He lived to be pretty old to have had all of that.” But because so many African Americans worked in the shipyards during World War II, there’s little doubt that it had an outsized impact on the community at large. Researchers have cited shipyard work as one of the reasons behind a 63 percent rise in cancer death rates among Black men between 1950 and 1977—nearly three times the increase among white men. The health of the river also suffered amid the frenzy of activity along its banks. In Portland’s early years, raw sewage and mill waste poured into the Willamette, befouling the water and killing fish. In the years leading up to the war and the shipbuilding boom, new sources of industrial pollution added to the mess. Steel fabricators, manufactured gas plants, and the shipyards themselves released heavy metals, petroleum products, and other contaminants into the river. The problem of industrial pollution only grew in later decades, even as city officials worked to manage wastewater. Ship dismantling and recycling, wood treatment facilities, chemical plants, and other operations contributed more of the same contaminants, along with other pollutants like polychlorinated biphenyls (PCBs), dioxins, and DDT. In all, the EPA has identified more than 150 potentially responsible parties that, together, released dozens of unsafe chemicals into the river. These industrial pollutants pose a threat even in low concentrations and can linger in the environment for decades. Many contaminants have built up in the river sediments, where worms, crustaceans, and other bottom-dwellers absorb them and pass them up the food chain into birds, fish, and, finally, people. These chemicals harm wildlife and have been linked to cancer, reproductive problems, and other health issues in humans. Based on extensive investigations, the EPA concluded that pollution in the Willamette presents an unacceptable health risk, primarily to those who consume fish from the river. For decades, that included many African Americans. “You could go down on Swan Island on any night of the week and you would find Black men and Black women, grandmothers and grandfathers down there with their children catching crappie,” says Paul Knauls Jr.
Knauls is an avid fisherman. He runs Geneva’s salon on Martin Luther King Jr. Boulevard with his father, Paul Sr., who is known informally as the mayor of Northeast Portland. Knauls says he, like Alcock and many others, stopped fishing in the Willamette long before the EPA’s declaration, when the river got so bad that fishermen started to see lesions on the fish. “We don’t do that anymore,” he says. Knauls says he feels that the community’s connection to the river has been severed, and it seems like the break was so clean, many younger people don’t even know about the pollution. Edwards-El is a community health worker in her early thirties with an ebullient personality and young kids of her own. She knew that lots of people used to fish. “So many people in the community, especially my grandparents’ age, that’s what they did,” she says. She herself has fond memories of going to Swan Island with her parents to swim and cast a line or two. She never caught much, although that didn’t matter. “Somehow we always found a little quiet spot,” she recalls. But Edwards-El didn’t know about the contamination in the river until a few years ago, when she saw a documentary made by PHCC. The film featured Wilma Alcock, and her story resonated with Edwards-El. Her relatives also worked in the shipyards during and after the war, and several developed lung diseases associated with asbestos. She thought back to her experiences playing in the river as a child, and of all the people she knew who still fished. Alcock still lives in what used to be the heart of Portland’s African American community, about a mile from where her parents’ house stood on Albina Avenue, before it was demolished to make way for the Fremont Bridge. On an overcast June day, her cozy apartment smelled sweet and fragrant. She had just finished making her specialty: 7-Up cake. Tired from the morning’s work, she settled back onto her green chenille sofa. Beside her, on an end table, sat an ornate vase bearing an engraved scene of a fisherman walking along a stream, pole slung over his shoulder. Alcock says her own rock-hopping days are behind her, and most of her fishing buddies have passed on now. 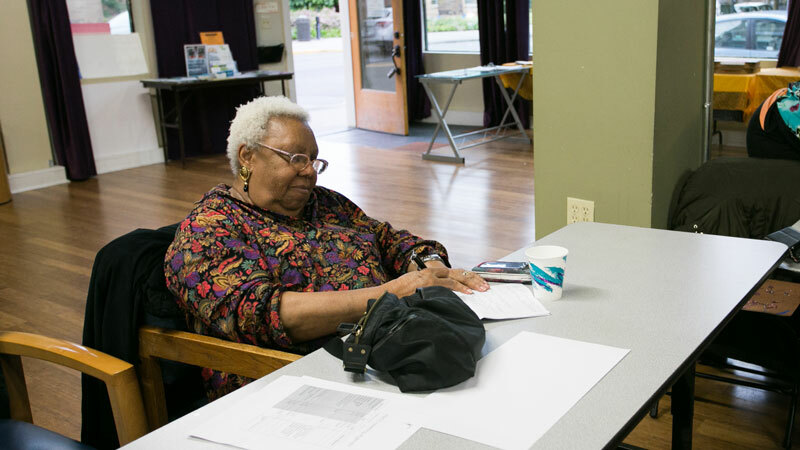 But her memories of the Willamette River remain powerful, in part because they are woven into the ongoing story of Portland’s development and its impacts on the African American community. The Willamette isn’t the first waterway she’s had to abandon because of pollution. Before Alcock fished in the Willamette, she and her father frequented the Columbia Slough. The slough is a narrow thread of water running through North Portland from Gresham to Kelly Point. But by the 1950s, the Alcocks abandoned the slough as sewage and industrial runoff transformed it into a festering ditch. Alcock remembers how, every day, at a certain time, a slaughterhouse would dump bloody waste directly into the water. The slough was later found to have high levels of PCBs and other harmful chemicals as well. Historian Ellen Stroud has written that the pollution of the slough reveals a story of environmental racism. North Portland has been associated with African Americans since Henry Kaiser built Vanport, a housing development for his shipyard workers, along the Columbia’s southern bank. From 1942 until 1948, when it was destroyed in a catastrophic flood, Vanport housed the majority of Portland’s Black population. That association, Stroud writes, seems to have contributed to the decision to sacrifice North Portland—and the slough—to industry. North Portland also housed the city’s primary garbage dump from 1940 to 1991, and has long suffered from poor air quality. “Whenever you look at where those toxic substances and hazardous substances lodge,” says Robin Collin, “it inevitably follows color.” Collin is an environmental justice expert and law professor at Willamette University in Salem. She says this pattern has been documented repeatedly, and often emerges from the perception that fear and disenfranchisement will keep communities of color from protesting the pollution. However, Stroud notes that North Portland’s reputation as a minority neighborhood wasn’t accurate until well after the Slough became polluted. Redlining forced most African Americans displaced by the Vanport flood to crowd into the Albina neighborhood on the east bank of the Willamette. Many people of color only started moving north later, in the 1960s and ’70s, as “urban renewal” projects such as the construction of the Memorial Coliseum and the I-5 freeway again displaced Black residents from Albina and the surrounding area. An upside of living in North Portland was that it offered easy access to the Willamette, which remained significantly cleaner than the slough. Alcock says many African Americans continued to fish at Swan Island and explored more northerly spots, like Sauvie Island and Cathedral Park in St. Johns. At least, until the effects of pollution became obvious in the Willamette too. And until another wave of growth and gentrification began displacing African Americans and other people of color yet again, this time to Gresham and East Portland. The Portland Harbor cleanup won’t turn back time, but it may offer a first step toward making amends. For Alcock, it starts with recognizing the impacts. On a recent Monday evening, Alcock, Edwards-El, and two dozen other members of the Portland Harbor Community Coalition gathered inside a spacious room on North Killingsworth. At the meeting, there was pizza and 7-Up cake for all, a babysitter, and a translator, who spoke softly into a microphone connected to headsets for three participants from Mexico and Central America. PHCC formed in 2013, several years before the EPA announced the cleanup plan. Then, the coalition’s primary purpose was to educate members of impacted communities about the state of the river and aid them in navigating the byzantine Superfund process. They helped members submit input and prodded the city to distribute $50,000 in grant funding to community groups to conduct culturally appropriate outreach in the final months of the public comment period. Donovan Smith has also been collecting stories of people’s connections to the river. Now that the cleanup plan has been finalized, however, the coalition is shifting focus. How to do that was the subject of this meeting. Cassie Cohen founded and helps lead the coalition, walked around the room passing out fliers outlining the PHCC’s Strategic Plan. Chief among the group’s goals are ensuring that community members get jobs—and any necessary training—associated with the cleanup. That way, they can benefit from the billion dollars that polluters will spend cleaning up the river over the next decade. The coalition’s first step has been to reach out to elected officials. The week before, Cohen and another PHCC member, Ranfis Villatoro, drove to Salem to talk with state lawmakers about adding language encouraging community involvement to a senate bill that would provide funds for the initial stages of sampling and cleanup. On July 7, the bill passed, including the new language and allocating $3 million for the Superfund site. But the ultimate plan is to craft a Community Benefits Agreement—a contract mandating that the responsible parties, who will pay for and carry out the cleanup under the EPA’s supervision, meet community standards for equitable hiring, river access, development, and other concerns. CBAs have been used before for cleanup and development projects across the country, and Villatoro is drafting a wide-ranging version for the Superfund project. The biggest challenge PHCC faces is that the companies who have to clean up the river do not have to sign on to such an agreement. The EPA can promote participation, but can’t require it. However, officials with the City of Portland, which will help oversee the cleanup and must also mop up its own historical messes, have said they share PHCC’s goal of prioritizing impacted communities. City officials haven’t yet agreed to a Community Benefits Agreement, but remain open to any vehicle that helps promote local jobs. Advocates hope that if the city and a few public utilities sign on to a CBA, it might generate momentum to bring other polluters on board too. There’s also the possibility that the Trump administration could cause the effort to stall. Although EPA Administrator Scott Pruitt has voiced support for the Superfund program, the president’s proposed budget calls for slashing its funding by 25 percent. In another blow to groups like the PHCC, Mustafa Ali, who founded the EPA’s Office of Environmental Justice, resigned in protest earlier this year after a leaked memo revealed that the administration planned to defund the department completely. But city and state officials appear determined to push forward with the cleanup no matter what. And Cherrell Edwards-El says the African American community should aim for more than just jobs. “That’s a great start, but we need much more,” she says. She wants to see affordable housing and development that allows access to the water. Julia Rosen is a freelance journalist in Portland.